Around 3500 BC, the Hougue Bie started as the site of a Neolithic burial ground which was covered by a passage grave together with a burial chamber. The passage grave comprised of a constricted passage which leads to a large oval chambers. Two small side chambers projected from the north as well as the south walls while a raised platform leads to a small end chambers situated towards the western area of the main chamber. This area could probably be the most sacred spot of the site. The huge upright stones together with the capstones in the tomb came from several places in the east of the island and could have been set in places with the use of earth ramps, wooden rollers with plenty of manpower. Though it has been referred as a tomb, the site has served a more complex purpose with various rituals and ceremonial tasks. For several centuries, it was open and in use prior to the tomb being eventually sealed and the site was abandoned. From early times, La Hougue Bie would have been acknowledged as a pagan site and was Christianised in the 12th century. On the summit of La Hougue Bie, a chapel had been constructed and probably replaced an older wooden structure. For four centuries, the chapel remained in use till the Jerusalem chapel and the crypt was built in 1520. Towards the Protestant reformation, the chapels were abandoned and later on, fell into ruin, but was re-consecrated in 1931 and extensively rebuilt. It was reoccupied in the 18th century and soon after 1780, the chapel ruins were transformed into a Neo-Gothic style house by the D’Auvergne family. The chapels’ interiors were extensively modified to create a large hall with windows on both sides. 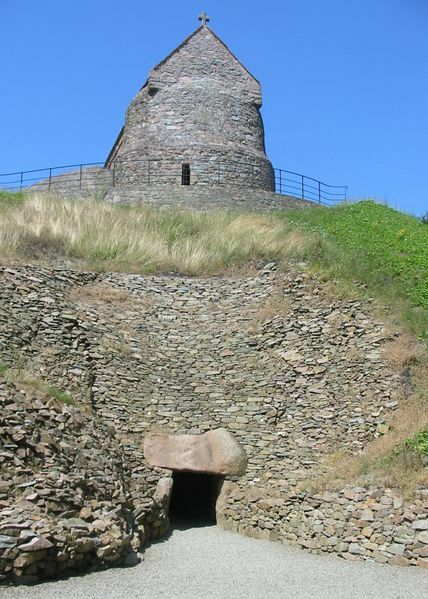 Towards the 18th century, the house had been abandoned and fell into ruins and the ruined towers of La Hougue Bie turned out to be an important landmark as well as a tourist attraction. It was described as the `wonder of the islands’ wonder’ in 1859.The site was then bought by the Societe Jersiaise for use as an historic site in 1920. However on 10th March 1942, German forces started building a battalion command bunker towards the eastern side of the Neolithic mound. The next few years thereafter, a total of around 70 trenches had been dug in the ground which resulted in extensive archaeological destruction. Dominating this tranquil as well as a spiritual site, a medieval chapel tends to sit on top of the prehistoric mound and monument. Different from several other monuments, one can stand inside the chamber of the passage grave and determine the heart of this place of worship. On the site, antique treasures are yet to be discovered in the archaeology and geology museum which includes coins stores, axes, swords and spears. Besides this, one will also find command bunker built during the German Occupation which accommodates a unique memorial to the slave-workers in the Channel Islands at the time of the Second World War. There is also a large picnic spot where one can enjoy an outing amongst the surrounding which tends to be peaceful and beautiful. Overall, it is an interesting place to explore during vacation.